I sorta had a little Taco Cabana addiction when I was in high school. At lunch, we would race to see who could get off campus and down Nacogdoches to the closest T.C. and get their chips and queso order in first! First to the table won!!! 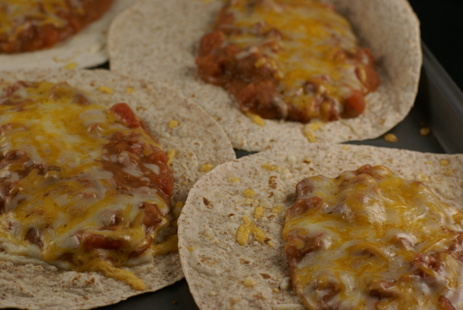 Bean and Cheese Tacos were always a fave then too. Today, I prefer them a bit spicier. These will kick up the spice factor a few notches. Would be great for breakfast, lunch or dinner! Or perhaps even a midnight snack. In a mixing bowl, stir together the refried beans and the Rotel diced tomatoes. Note: if you don’t drain the tomatoes well, the beans won’t be very thick. Preheat the oven to 350. Lay the tortillas out on a baking sheet. 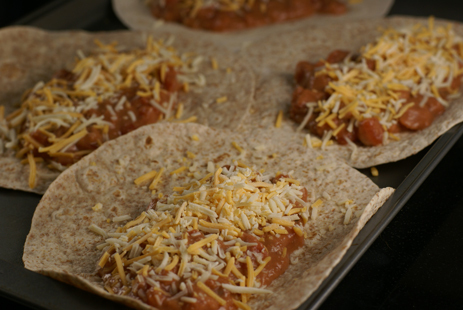 Spoon the tomato-beans mixture over the tortillas and top with shredded cheese. Add lots of cheese if you like. Bake in the preheated oven for 5 to 15 minutes. 5 minutes to melt the cheese and still be able to roll up the tortilla. Or 15 minutes if you want more of a tostada/crispy tortilla. These sound good, and easy! How do you prepare your refried beans? I don’t think we HAVE taco cabana here! Dang. I would love some of those tostadas! OMG, I went to the same high school in San Antonio and I remember spending many early mornings (and late nights) with my friends on the patio outside. I will definitely be making these to satisfy my TC cravings! My fav part of summer is the opportunity to grill more. We load up the grill and have meals from one session. Yummy. how do you make refried beans? You’re lucky your Taco Cabana addiction ended in high school! I live 1 mile away from one in Austin. This recipe looks delicious and a little healthier. I just made these for lunch for my kids, and they gobbled them up! I added 6 oz of shredded grilled chicken and a little bit of homemade taco seasoning (your recipe), and they came out great! I made a double batch, so I now have a freezer bag full of quick and healthy lunches for those days when things are a little hectic. My kids love burritos, but I could never find any frozen ones that were healthy. Thank you so much for the recipe and your website! When I was searching for your facebook page to enter a contest a while back, I discovered you graduated from my high school also. I’m a few years older than you though. I’ll just say I was in high school when there was only one Taco Cabana. 🙂 GO MULES? Totally…Go Mules! And I miss me some Taco Cabana!!! I meant to ask a real question too….if you freeze them, how do you reheat them? In the microwave like the frozen ones at the store? I usually pull out the bean and cheese tacos the night before and let them “warm up” in the fridge. Then finish reheating them completely in the microwave. Also, I wrap them in a napkin or paper towel to soak up the moisture and keep the tortilla from getting soggy.